These new Nautilus Li-Ion batteries with the green labels are labeled LION-2 and have 3x the battery capacity of the previous grey coloured NiCad batteries. These batteries do not suffer from the 'memory effect' problems that the previous NiCad batteries had and therefore you can charge them for short periods without any adverse effects. The LION-2 batteries are the same price as the previous batteries and therefore you get three times the operating period with no increase in cost. The LION-2 batteries can be used in the 120SSF, 140SSF, 180SSF and 188SSF units without any problems or any changes required. If the LION-2 batteries are accidentally charged in the older NiCad Charger no damage will be caused to either product and the LION-2 batteries will not charge. 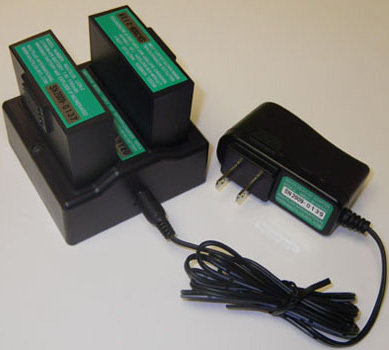 If the older Nicad batteries are charged in the ne LION-2 Charger no damage will be caused to either product and the NiCad batteries will not charge. Each LION-2 Charger is supplied with an ACDC-2 Adaptor which requires an input of 90VAC-250VAC at 50/60Hz. Battery dimensions: 55.5mm x 64 x 25.6mm 2.2" x 2.5" x 1"